It’s been more than two years since the last time I posted set-up instructions for Vrui and HTC Vive, and a lot has changed in the meantime. While Vrui-5.0 and its major changes are still not out of the kitchen, the current release of Vrui, Vrui-4.6-005, is stable and works very well with the Vive. The recent demise of our CAVE, and our move towards VR headsets until we figure out how to fix it, have caused a lot of progress in Vrui’s set-up and user experience. The rest of this article contains detailed installation and set-up instructions, starting from where my previous step-by-step guide, “An Illustrated Guide to Connecting an HTC Vive VR Headset to Linux Mint 19 (“Tara”),” left off. and a working installation of SteamVR. If you use a Linux distribution that is not Ubuntu-based, such as my own favorite, Fedora, or another desktop environment such as Gnome Shell or Cinnamon, you will have to make some adjustments throughout the rest of this guide. AltspaceVR, the popular virtual reality social platform, and the eponymous company behind it, will be closing their respective doors on August 3rd. This is surprising, as AltspaceVR has been around since 2013, was well-funded, had a good amount of users given VR’s still-niche status, and had apparently more funding lined up to continue operation and development of their platform (that funding falling through was, according to the announcement linked above, the primary reason for the impending shut-down). But besides the direct impact on commercial VR as a whole, and the bad omen of a major player closing down, this is also personal to me. Not as a user of AltspaceVR’s service — I have to admit I’ve only tried it for minutes at a time at trade shows or conferences — but as someone who was, albeit tangentially, involved with the company and the people working there. After having given a presentation at an early SVVR meet-up, I invited SVVR’s founder, Karl Krantz, to visit me at my VR lab at UC Davis. He made the trip a short while later, and brought a few friends, including “Cymatic” Bruce Wooden, Eric Romo, and Gavan Wilhite. I showed them our array of VR hardware, the general VR work we were doing, and specifically our work in VR tele-presence and remote collaboration. According to the people involved, AltspaceVR was founded during the drive back to the Bay Area. In addition, I co-advised one of AltspaceVR’s developers when he was a PhD student at UC Davis, and I visited them in the summer of 2015 to give a talk about input device and interaction abstraction in multi-platform VR development. During that visit, Eric Romo also gave me my first taste of the newly-released HTC Vive Development Kit (Vive DK1). For all that, I am sad to see them go under, and I wish everybody who is currently working there all the best for their future endeavors. Possibly related to this, another piece of news surfaced today: AltspaceVR was named defendant in a patent infringement lawsuit filed by Virtual Immersion Technologies, LLC, regarding this 2002 patent. I do not know whether this filing was a cause in AltspaceVR’s closing, but it is possible that the prospect of a costly court case, or stiff licensing fees, led to some investors getting cold feet. Either way, this patent deserves closer scrutiny as it is quite broad, and has recently changed ownership from the original inventors to the plaintiff, who has so far been using it exclusively to sue VR companies for infringement. The fact that it specifically claims the use of video to represent performers or users in a shared virtual space might mean that it covers platforms such as our tele-collaboration framework, which would be unfortunate. I have a hunch that this patent, due to its arguably broad applicability, will be the subject of a major legal battle in the near future, and while there is a lot of prior art in multiplayer/multi-user VR, that video component means I cannot dismiss the patent out of hand. I know, the Oculus Rift DK2 is obsolete equipment, but nonetheless — there are a lot of them still out there, it’s still a decent VR headset for seated applications, I guess they’re getting cheaper on eBay now, and I put in all the work back then to support it in Vrui, so I might as well describe how to use it. If nothing else, the DK2 is a good way to watch DVD movies, or panoramic mono- or stereoscopic videos, in VR. 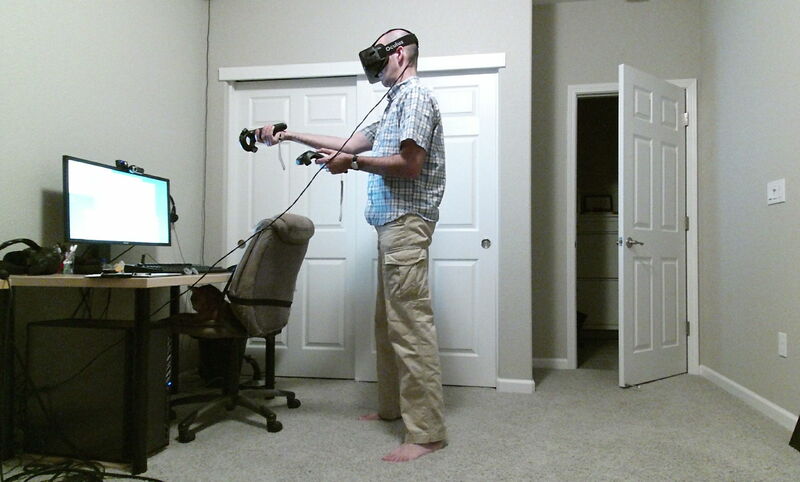 Figure 1: Using an Oculus Rift DK2 headset with a pair of Vive controllers — because why not? I’ve been busy finalizing the upcoming 4.0 release of the Vrui VR toolkit (it looks like I will have full support for Oculus Rift DK2 just before it is obsoleted by the commercial version, haha), and needed a short break. So I figured I’d do something I’ve never done before in VR, namely, watch a full-length theatrical movie. I’m still getting DVDs from Netflix like it’s 1999, and I had “Avengers: Age of Ultron” at hand. The only problem was that I didn’t have a VR-enabled movie player. Well, how hard can that be? Not hard at all, as it turns out. I installed the development packages for the xine multimedia framework, browsed through their hacker’s guide, figured out where to intercept audio buffers and decoded video frames, and three hours later I had a working prototype. A few hours more, and I had a user interface, full DVD menu navigation, a scrub bar, and subtitles. In 737 lines of code, a big chunk of which is debugging output to trace the control and data flow of the xine library. So yeah, libxine is awesome. Then it was time to pull the easy chair into the office, start VruiXine, put on the Rift, map DVD navigation controls to the handy SteelSeries Stratus XL bluetooth gamepad they were giving away at Oculus Connect2, and relax (see Figure 1). 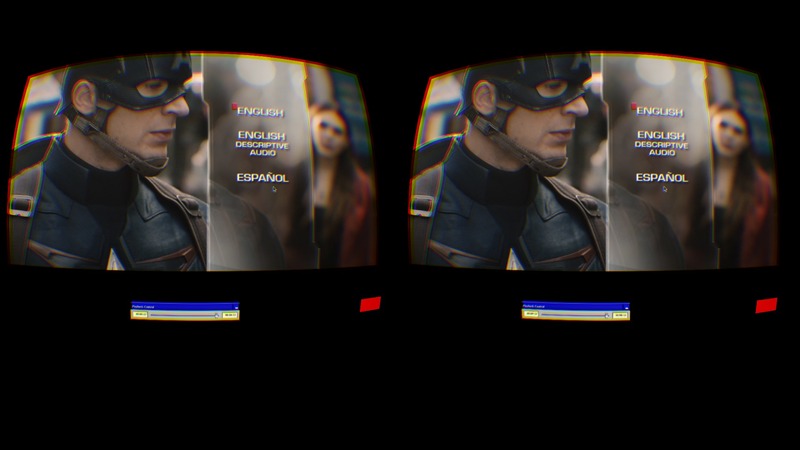 Figure 1: The title menu of the “Avengers: Age of Ultron” DVD in a no-frills VR movie player (VruiXine). Fancy virtual environments are left as an exercise for the reader.